LAREAC is a group of professional appraisers in Louisiana who will: be proactive in legislative and regulatory issues affecting Louisiana appraisers, promote the appraisal industry as a profession, provide a central source of information to appraisers in Louisiana and meet annually to share cutting edge information for Louisiana appraisers and hold elections for leadership for the coming year. Membership in the LAREAC shall be open to individuals only. There shall be three classes of membership: LOUISIANA STATE REGULATED APPRAISER, “ASSOCIATE”, and“HONORARY/AFFILIATE”. LOUISIANA STATE REGULATED APPRAISER MEMBERSHIP: Must be a resident of Louisiana who is primarily engaged in appraisal activity that is regulated by the Uniform Standards of Professional Appraisal Practice. This membership has voting rights. ASSOCIATE” MEMBERSHIP: Must be a non-resident of Louisiana who is primarily engaged in appraisal activity that is regulated by the Uniform Standards of Professional Appraisal Practice. This classification shall be non-voting. 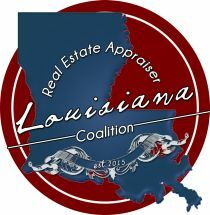 “HONORARY/AFFILIATE” MEMBERSHIP: Persons who do not otherwise qualify for LOUISIANA APPRAISER, yet, have an interest in the real estate appraiser as a profession, or those who do qualify for LOUISIANA APPRAISER but who cannot be a paying member of LAREAC by virtue of their position as a government employee or regulatory official. This classification shall be non-voting. Officers and members of the Board of Directors shall be LOUISIANA STATE REGULATED APPRAISER members. Voting on the affairs of the LAREAC shall be limited to LOUISIANA STATE REGULATED APPRAISER members. Members of the LAREAC shall uphold the rules and regulations of the LAREAC, accept the decisions of its various officers, Board of Directors and Committees, and abide by their rulings in connection with the business of the LAREAC. The annual dues of each membership category shall be determined by the LAREAC Board of Directors. Annual dues may be adjusted by vote of the Board of Directors in the last quarter of any year. A full price membership, paid in December, may be considered payment for thirteen months. There will be no refunds on dues. Dues will be prorated based on what month the appraiser joins. The current membership dues as of January 1, 2015 is $99.00 annually. The President shall preside at all meetings of the LAREAC, and have general charge of the affairs and business of the organization. The President shall from time to time establish such committees, working groups and task forces as appropriate and appoint members thereto; and shall be an ex-officio member of all committees. The Vice President shall assist the President in the affairs of the LAREAC; be responsible for promoting membership in the LAREAC; and shall undertake any special projects determined by the President. In the absence, refusal or inability of the President to act, the Vice President shall serve as acting President until the President is in a position to resume the duties of the office. Directors; and shall perform such other duties as may be prescribed by the officers or President. The Treasurer shall ensure the accurate accounting of all income and expenses of the LAREAC and proper safeguards thereto, and shall render a statement of accounts at each regular meeting of the Board of Directors, and at such other times as the Board of Directors may require; and perform such other duties as may be prescribed by the officers or President. The administrative duties of the LAREAC shall be administered by a paid position as prescribed by the board. The governing body of the LAREAC shall be a Board of Directors consisting of 11 Directors: the elected officers plus seven members of the LAREAC with one from each Louisiana Congressional District and TWO At Large Directors. The remaining Directors shall serve for terms of two years, except during the first year of the organization, when an unspecified number of the elected directors shall be appointed for one-year terms. Thereafter, as many Directors shall be elected each year as are required to fill vacancies. No “District” or “At Large” Director shall serve for more than four consecutive years “unless they also serve as an officer”. Any Director who is elected as the “Secretary” or “Treasurer” or to any other vacant officer position will automatically vacate their remaining term as a District or At Large Director. A quorum for the transaction of business by the Board of Directors shall consist of a majority of members of the Board of Directors. Business maybe conducted via telephone conference calls and the Internet. “The Executive Committee will be comprised of the four officers and the At Large Director. The purpose of the Executive Committee is to review appropriate issues prior to introduction and voting to the full Board of Directors. “An Alternate District or At Large Director position and” all vacancies on the Board of Directors between elections shall be filledby appointment by the President, subject to approval by the Directors at its next regularly scheduled meeting. Such appointee(s) shall serve until the next regular election. The election of the Board of Directors and Officers shall take place at the annual meeting. The position of any member of the Board of Directors absent from two consecutive meetings of the board, without an excuse deemed valid by the President, shall be vacant. Any member of the Board of Directors found in violation of Louisiana Appraisal law shall be replaced with a new appointment at the next regular meeting of the Board of Directors. The Nominating Committee shall consist of five individuals, one of whom shall be the Past President or an appointee of the board the LAREAC who shall Chair the Committee. The LAREAC President cannot be one of the appointees to the Committee. The LAREAC President shall appoint two members of the Committee. The members of the Board of Directors must elect the remaining two. At least one appointment to the Nominating Committee shall be a District Member. Nomember of the Nominating Committee shall be eligible as a nominee. Appointments to the Nominating Committee shall be made at least ninety days prior to the annual meeting of the LAREAC. The LAREAC Nominating Committee shall propose a new “Secretary” and “Treasurer” offices and director nominees for election by the general membership of the LAREAC. The slate shall include at least one nominee for each office and director positions to be filled in any year. The proposed slate of nominations shall be sent to the general membership at least thirty days prior to the annual meeting. Additional candidates for these offices may be placed in nomination by a written petition sent by US Mail to the current mailing address of LAREAC. Written Petition Candidate Nominations must be post marked at least 45 days prior to the annual meeting date. Any candidate nominated must be a LAREAC Louisiana State Regulated Appraiser member in good standing and must have agreed in writing to serve. The election is to be conducted at the annual meeting or by electronic ballot. The final slate of Officer(s) and Directors shall be elected by a vote of the majority of the eligible members present. The LAREAC Nominating Committee will be responsible for counting the ballots and insuring that those voting are eligible to vote. Those candidates who are elected shall be installed at that the annual meeting. Duties and Conflict of Interest Policy. eeting of the LAREAC shall be held in first quarter of each year, the date, place and hour to be designated by the Board of Directors. General membership meetings of the LAREAC shall be held as scheduled by the Board of Directors. If a meeting is called at any other time, notice shall be given to every member entitled to participate in the meeting at least ten days preceding such meeting. The Board of Directors shall meet at the annual meeting of the LAREAC and quarterly each year. Additionally, meetings of the Board of Directors or general membership meetings may be called at such other times and places as the Board of Directors shall designate. Members present in person or electronically and eligible to vote. The current edition of Robert’s Rules of Order shall govern the procedures at meetings of the LAREAC, the Directors, and the committees, except when in conflict with these Bylaws. LAREAC shall use its funds only to accomplish the Purposes stated in these Bylaws, and no part of its funds shall inure or be distributed to the members of LAREAC. Upon dissolution of LAREAC, the residual assets shall be distributed to one or more regularly organized and qualified organizations to be selected by the Board of Directors. These Bylaws may be amendedby a majority vote of the Board of Directors present at any meeting, at which a quorum is present, provided such proposed amendment or amendments shall be plainly stated in the call of the meeting. Notice, made at a regularly scheduled Board Meeting, or by US mail or email, with email receipt verification, of all meetings at which such amendments are to be considered and shall be given to every Director at least ten days prior to time of the meeting.